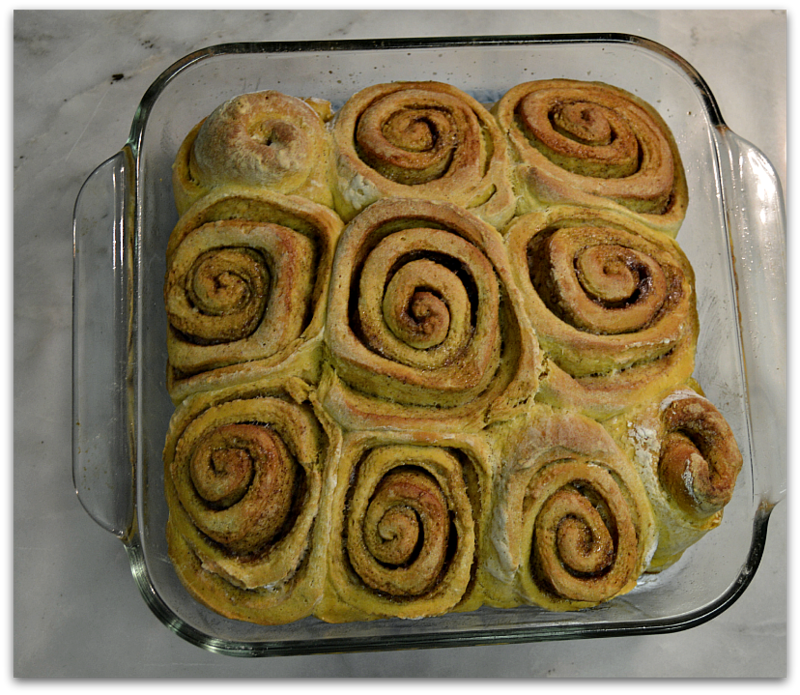 Making homemade cinnamon rolls isn’t as hard as you may think. 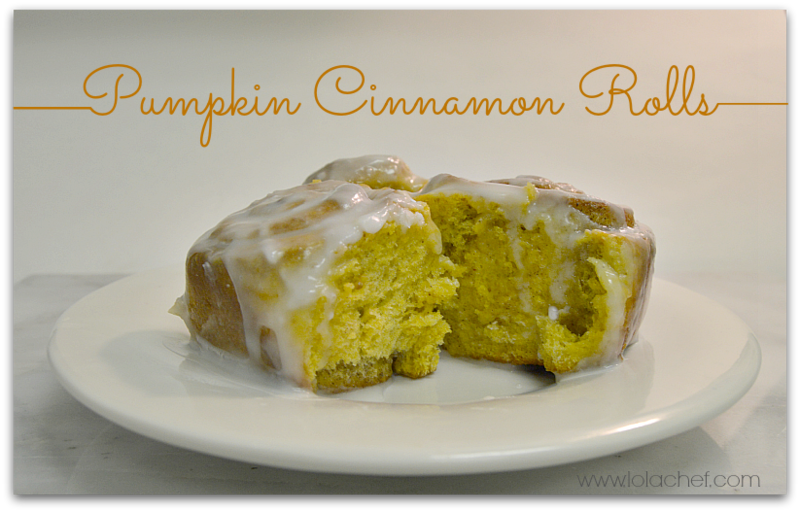 The addition of pumpkin is perfect for fall and creates a moist and delicious treat. Pumpkin is an excellent way to sneak a vegetable into so many recipes. I have an extremely picky eater who will eat pumpkin anything, so I have been working on a LOT of pumpkin recipes this season. In a small bowl whisk 1/2 cup water and 1 tsp sugar with the active dry yeast. Let sit for 5 – 10 minutes or until foamy. In another small bowl mix 1/2 cup sugar, 1/2 cup brown sugar and 1 tbsp cinnamon for filling, set aside. In a medium bowl, place 3 cups of the flour, salt, cinnamon, nutmeg, and allspice. Using a mixer with blend 6 tbsp butter and sugars in a large bowl. Add egg, yeast mixture, milk, and pumpkin blending well. Switch the mixer attachment to the dough hook and slowly add flour mixture until mixture is a workable dough. You may need to add more than three cups. Keep adding flour until dough isn’t too tacky bring to a clean and floured work surface. Add more flour and knead for about 5 minutes. You can keep adding flour until dough is not sticky and is workable. It may take up to 5 cups or more to get the dough right. Once it is ready place in an airtight container or covered bowl to let rise until doubled in size, about 45 minutes – 1 hour. This dough works well if left to rise overnight in the refrigerator. 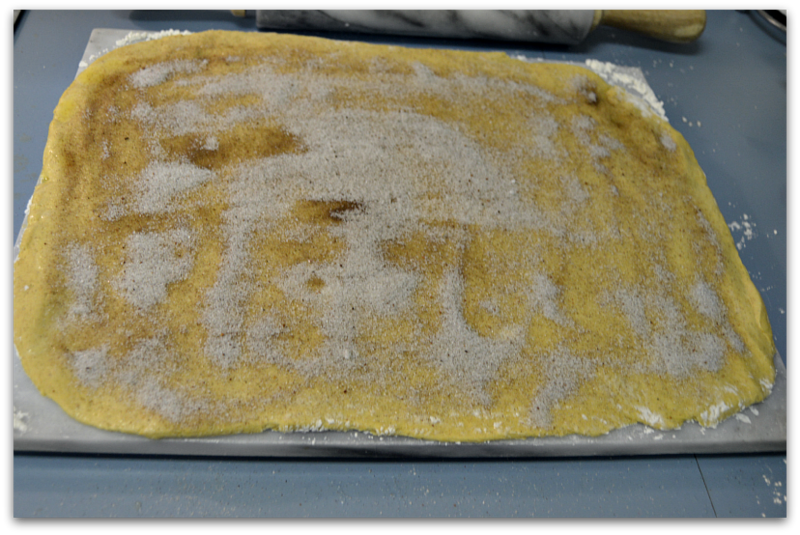 Once the dough has risen, place onto a clean floured work surface and roll out into a large rectangle. 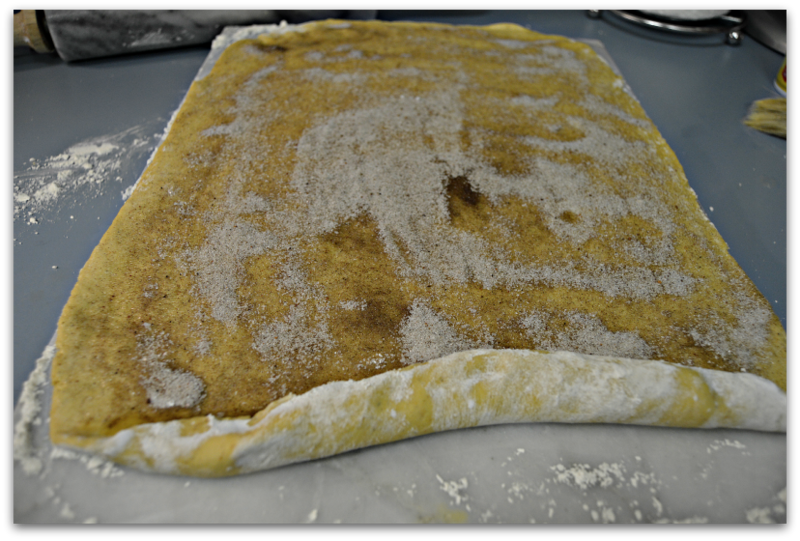 Then using the remaining 2 tbsp of butter, melt the butter and spread over dough. Then sprinkle with the filling mixture. 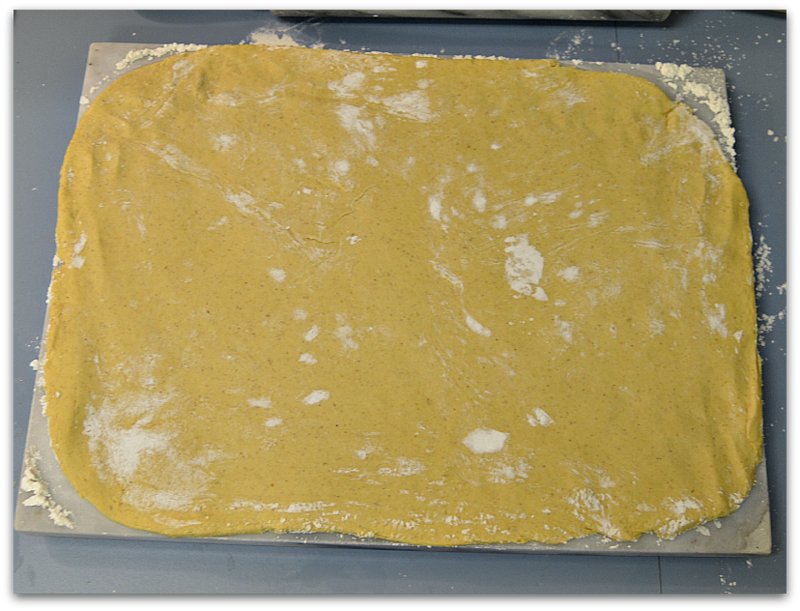 Starting from one side of the dough tightly roll into one single roll. Then cut into 2 inch thick rolls and place in a greased pan and cover. 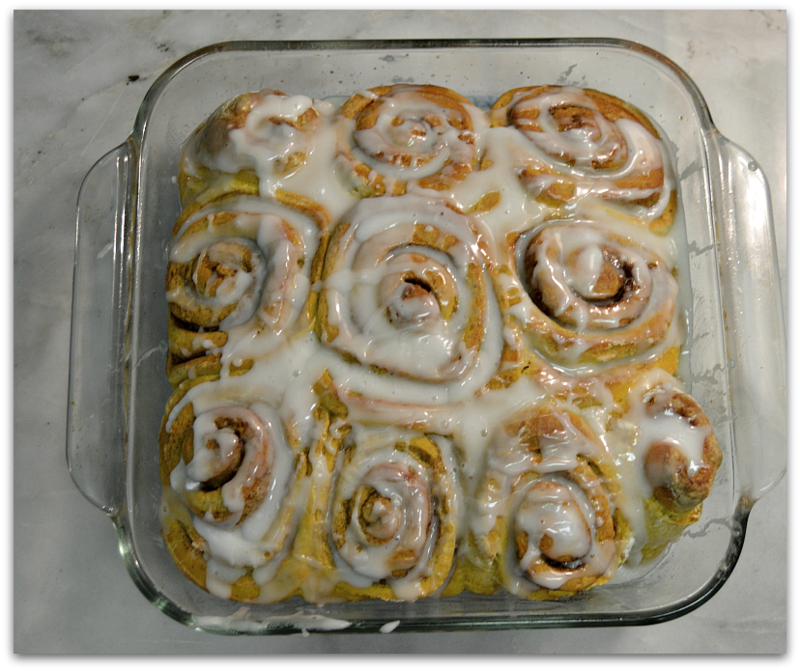 I also add additional melted butter to tops and sides, then let the rolls sit for at least 15 – 20 minutes to rise again. Bake at 375 degrees for about 20-25 minutes. The filling will be bubbly and the tops should be golden brown. While they cool mix confectioners sugar and milk in a small bowl. Add milk slowly and blend, add additional sugar to get the right consistency. I like to make it thick so it will melt well over the hot roll. Serve warm, can be refrigerated for a few days and reheated again. 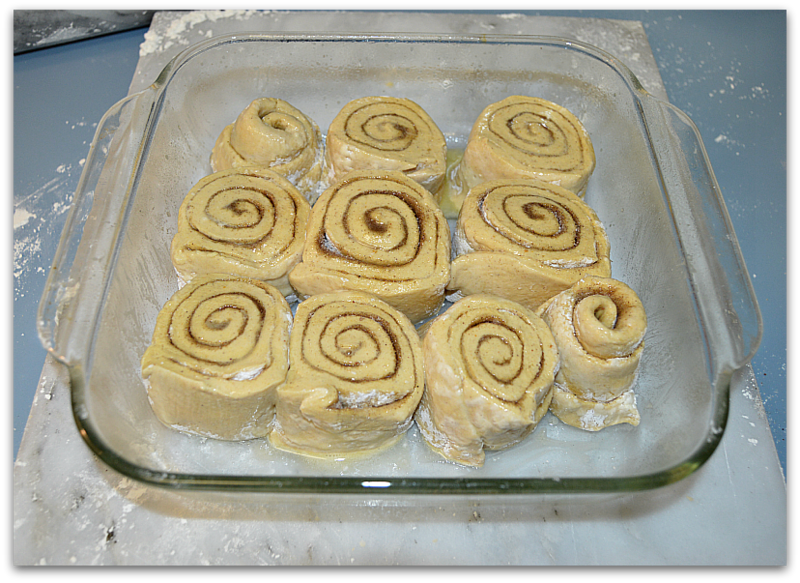 I like to make on the weekends so we can have fresh cinnamon rolls for breakfast during busy weekdays. This recipe made a lot of rolls, the ones in the picture was leftover. These rolls disappeared fast! If you are going to take the time and effort to make recipes from scratch it makes it even more worth it if you can store more for later use. For more pumpkin recipes see Pumpkin Pancake Recipe.